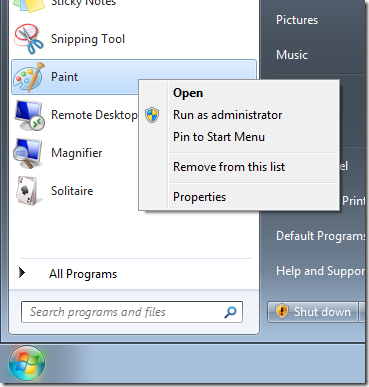 The setting of the week this week disables one of the features in Windows 7 that allowed users to pin programs to the taskbar. This option will be handy if you are in an environment where you want to prevent users from customising the taskbar such as a kiosk or library style computer. 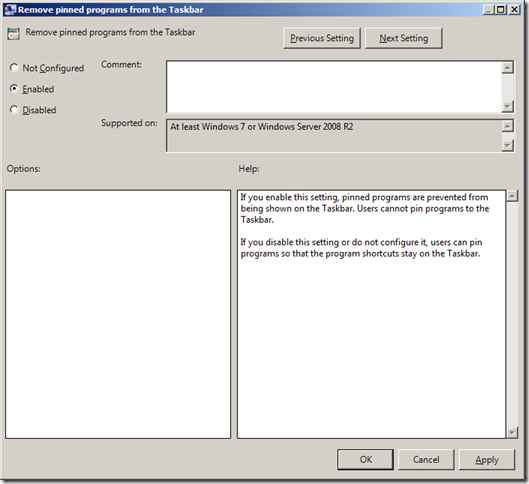 The setting can be found under User Configuration > Policies > Administrative Templates > Start Menu and Taskbar and only applies to Windows 7. Note: If you do apply this setting to your existing users all the existing pinned taskbar programs will be removed on the next logon. Below are some screenshots of the UI with the setting enabled. All existing pinned programs will be removed. But preferences have the ability to create shortcuts – just not these yet as far as I am aware. Any knowledge of if I am behind the times here, or if Microsoft will ever do this? From someone who does Windows 7 deployments point of view, this is really frustrating!! Thanks for the quick reply Alan. In a way I can understand Microsoft’s response, but from a deployment and administration point of view, it feels very messy having to do it the “no easy way”. Hopefully one day that might change, cause Policy and Preferences are FANTASTIC and simple ways of managing the desktop. BTW – it was a while ago, but very good Group Policy presentation by yourself and Lilia Gutnik at TechED Aust 2009. Any chance you can go into the detail of how you deployed the pinned items to users via group policy. @Nick You cannot easly control what programs are pinned to the taskbar. This is an area that meant to be controled by the user and not applications. Just take a look at the way the system tray was used (abused) by application installing icons… this is what this was mean to prevent. Is this a way for the IT department to track what people do? Sorry if this is a silly question.